Andrew Parkin is Keeper of Archaeology at the Great North Museum where he is responsible for the archaeology and ethnography collections. He is particularly interested in the archaeology of the Greek and Etruscan world, his latest research has concentrated on Etruscan bronze mirrors in the Shefton Collection. He is currently working on an exhibition about Gertrude Bell which is due to open in January 2016. Sally Waite is a Teaching Fellow in the School of History, Classics and Archaeology. She teaches Greek Art and Archaeology at undergraduate and postgraduate level. Her research focuses on the history of collections. Most recently she curated an exhibition on the Kent Collection of Greek and Cypriot pottery at the Royal Pump Room Museum at Harrogate. 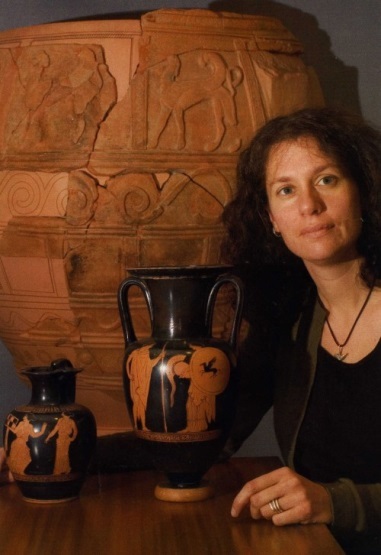 She has worked extensively on the Shefton Collection of Greek and Etruscan Archaeology. The Shefton Collection takes its name from its founder Professor Brian B. Shefton (1919 – 2012), a Classical archaeologist based in Newcastle from the mid-1950’s until his death in January 2012. 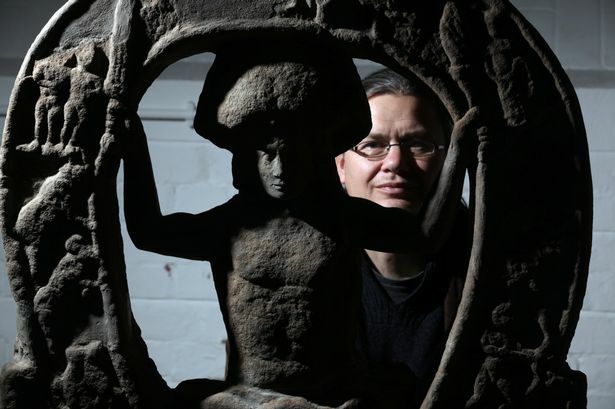 Brian Shefton first came to Newcastle in 1955 as a lecturer in Greek Archaeology and Ancient History; he remained for the rest of his career, becoming Professor of Greek Art and Archaeology in 1979. One of his most significant achievements was the creation of a collection of classical antiquities. This Collection moved from the University campus to the Great North Museum in 2009 and is now housed in the Shefton Gallery of Greek and Etruscan Archaeology. It continues to be used for University teaching and research but over the years its remit has expanded to encompass work with other audiences, in particular local schools. The Collection is not widely known and a priority has been to raise its profile and make it more accessible. A project funded by Renaissance North East and the Catherine Cookson Foundation catalogued the Etruscan material in the Shefton Study Collection. This was originally conceived as a collaborative project to document and disseminate Professor Shefton’s knowledge of the collection. We worked together in the months before his brief illness and sudden death and the resulting catalogue will form an addendum to a larger project funded by the Pilgrim Trust to enhance and digitise the Shefton Collection records for all objects on display in the Shefton Gallery. The illustrated database has recently been completed and, once on-line, will provide a platform for students, researchers and others to access the Collection. In April 2013 the University and Great North Museum hosted a series of public lectures and an international conference (PDF: 1.77MB) in memory of Professor Shefton. Leading academics and museum specialists presented on key pieces in the Shefton Collection. As a result of this conference we are currently co-editing, alongside Professor Sir John Boardman, some of the papers, together with others especially commissioned, to be published in a forthcoming book: On the Fascination of Objects: Greek and Etruscan Art in the Shefton Collection. An additional element of the Shefton memorial events was an engagement project undertaken with West Jesmond Primary School in Newcastle. 572 children (aged 4 to 11) were given the opportunity to create their own artworks inspired by selected objects from the Shefton Collection. Children participated in archaeology workshops at school and were encouraged to produce an individual creative response to the Greek and Etruscan objects they encountered. The workshops were facilitated by both undergraduate and postgraduate student volunteers. Reception children, for example, created their own fishplates. These were based on several examples of this distinctive type of Greek decorated pottery in the Shefton Collection. 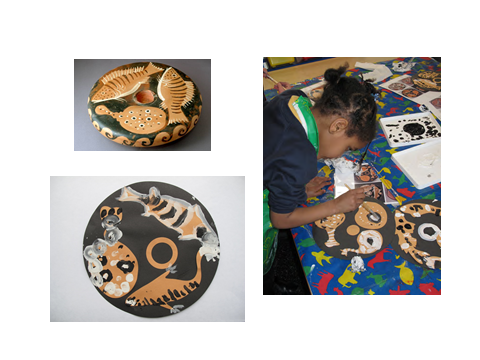 Many of the children focused very closely and were able to produce their own versions of the plates. A selection of the children’s art work was displayed alongside the artefacts in a special exhibition in the Great North Museum. As part of this project 90 year 3 pupils also attended a Greek activity day in the Great North Museum. Here they took part in a range of activities, guided by student volunteers and museum staff, including pottery making, cartoon drawing and gallery based workshops. The project gained momentum growing beyond its original scope, for example the school set up their own exhibition in their visitors’ reception area, revealing the extent of their engagement with the project and pride in what they had achieved. We recently had the opportunity to present a paper on current research and engagement initiatives involving the Shefton Collection at an international conference hosted by Aarhus University in Denmark. This conference explored some of the challenges facing classical collections in Universities and the ways in which different institutions have tried to make their collections relevant to wider audiences. Impact from critical research: what might it look like and what support is required? What use is academia for small businesses and community interest companies? Higher spending on elections generally increases levels of integrity : Democratic Audit UK on Does the Cost of Elections Matter For Election Quality?